May 03, 2016 (LBO) – Sri Lanka’s Commercial Bank of Ceylon has formalised its tie-up with the Bank Muscat Oman to facilitate remittances to Sri Lanka. 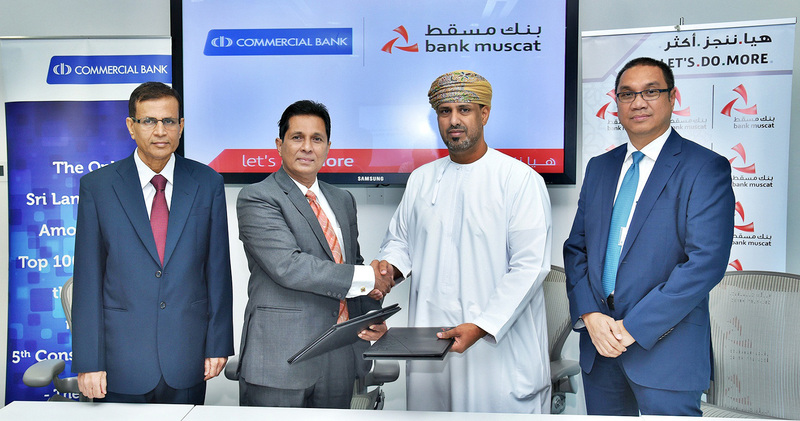 Commercial Bank said that remittances will be facilitated through the Bank Muscut’s new mobile banking app, with the signing of an agreement in Muscat. The mobile app makes it possible for users to send cash remittances to recipients in Sri Lanka or transfer money to accounts at Commercial Bank 24/7. They may also transfer funds to accounts at other banks in Sri Lanka via Commercial Bank. The agreement between the two banks was signed by Abdullah Tamman Al Mashani, Deputy General-Manager, Institutional Sales & Products Development of Bank Muscat and Palitha Perera, Assistant General Manager, Operations of Commercial Bank, in the presence of J. H. Liyanage, Minister for Commerce from the Embassy of Sri Lanka in Oman and other officials.